Pardon the scarce posting the past few days. The family made a pilgrimage to Iowa this past weekend. The main intent was celebrating the diaconate ordination of a close friend. His wife passed away just two months ago, and we didn’t know until about a week before he and the archbishop decided to postpone his ordination until his life could settle. We have close friends who are deacons, including in the two families to which we were closest during out five years at St Edward Parish in Waterloo. It’s hard for me to slip away on a non-summer weekend, but since it was all set up, there was no real reason not to go. Brit had only a half-day of school so we managed to hit town by 6PM Friday. The ordination liturgy was my first in over twenty years. 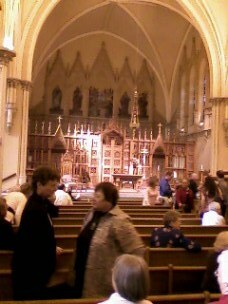 We were at St Raphael Cathedral in Dubuque (imaged before Mass above). It’s a bit of a strange place. Lots of wood, including the rood screen that separates the nave from the old high altar and tabernacle. But the floor is 100% carpet. Even so, the people sang with gusto. But you expect the spiritual motivation to overcome the floor padding for an event like this. How ubiquitous the Culture of Complaint! We had a pleasant time visiting with diocesan friends at the reception, plus taking in the 9AM Mass at my old parish ( a mostly uncarpeted nave pictured above). One of the people I trained to be a cantor thought I was in town to interview for the music director position, recently opened up with a defection to a better-paying and full-time job. The experience of going to Mass was bittersweet. It was neat to visit with old friends before and after liturgy. It sounded good to be worshipping in a great church building renovated by people who really had their priorities straight. But communities change and grow. I saw just a few of the people I knew as children when I worked there. I heard great stories about their involvement in Newman centers, or early in their professional careers–usually elsewhere and often out of Iowa completely. Iowa was quite an extraordinary experience for me. While I understood that some people were driven to follow their star far from their place of birth–I am one of those people, after all. I could never quite comprehend why the powers-that-be in the communities of the state were and are so hell-bent on making it so unfriendly for young adults. Top that off with a very flimsy sense of cultural Catholicism, and I found my Sunday reflections saddened by the situation I saw. I’m always hopeful that I’ll see something amazing at a hockey game, like a team battling back from five goals down to win. Sadly, it was not to be. After the game we had a nice meal here, though the style of their Murgh Korma was a bit different from other Indian restaurants in the KC area–to the disappointment of my wife and daughter. I enjoyed a Kashmiri chicken dish in a tomato sauce. It was good, but not quite as good as the hearty chicken dishes I’ve had locally here. But we’re quibbling over a half-star as far as I’m concerned. I’ll definitely have to go back to that place and sample other food. Ah well! It’s good to be home in Kansas City. This entry was posted in Food, Ministry, My Family, Other Places, Sports. Bookmark the permalink.